Grant Associates’ Nest House was one of 6 winning designs for an international competition to create a sustainable dwelling set within an island tropical landscape. 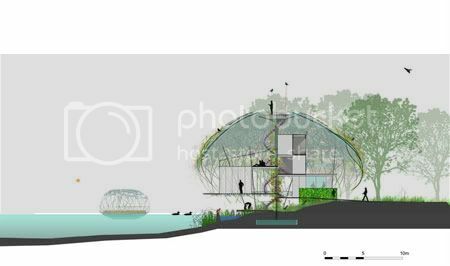 The idea is simple: to create energy efficient residential dwellings on Bird Island at Sentul West and promote contemporary architecture with a bent on sustainable technologies. 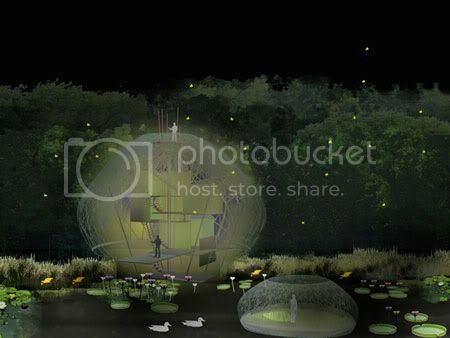 The Nest House takes its inspiration from the bird inhabitants of Bird Island, with living spaces wrapped within a functional and beautiful woven dome, suggestive of weaver bird and bower bird nests. Its outer skin is a rough weave of found materials, onto which are fixed photovoltaic and solar thermal panels. Its edges are clad in tropical planting, with epiphytes, ferns, orchids and climbers. The internal facilities are a very simple sequence of beautiful boxes and ledges. This contrast between the natural rough envelope and the artificial smooth interior gives the house its distinct character. The Nest House sits close to the ground and engages with the lake and surrounding landscape. Floating islands and edge planting of tropical marginal and aquatic species form an attractive outlook from the house and attract birds to inhabit the grounds and water around the structure. Bird Island is a sustainability project of Malaysia's YTL Corporation in 'seeking zero'. 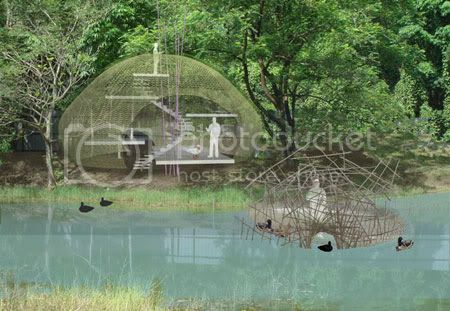 A test bed for sustainable living and responsible development. how do you water proof this structure? in a durable way.